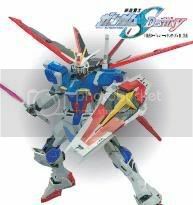 The ZGMF-X56S/β Sword Impulse Gundam is the ZAFT equivalent to the Earth Alliance's GAT-X105+AQM/E-X02 Sword Strike Gundam. 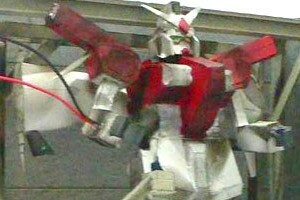 The Sword Silhouette pack is stored on the Minerva's dedicated hangar for the Impulse Gundam and is sent out onto the field via a computer-controlled flyer craft. 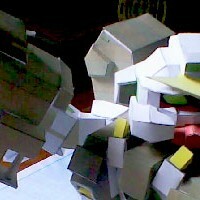 The flyer delivers the pack to the Impulse Gundam and automatically returns to the Minerva. 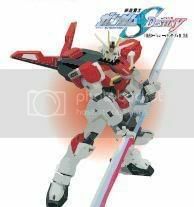 The Sword Silhouette pack's armaments include two beam boomerangs similar to the ZGMF-X09A Justice Gundam, as well as a pair of anti-ship swords similar to the GAT-X133 Sword Calamity. The "Excalibur" swords can be combined into one large sword to attack several mobile suits or a battleship. The ZGMF-X56S/α Force Impulse Gundam is the ZAFT equivalent to the Earth Alliance's GAT-X105+AQM/E-X01 Aile Strike Gundam. 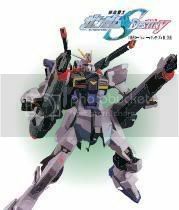 The Force Silhouette pack provides the Impulse Gundam with increased mobility in space, as well as atmospheric flight on Earth. The Force Silhouette pack is stored on the Minerva's dedicated hangar for the Impulse Gundam and is sent out onto the field via a computer-controlled flyer craft. The flyer delivers the pack to the Impulse Gundam and automatically returns to the Minerva. The Force Silhouette pack docks with the Impulse Gundam via a laser lock. The only additional armament carried by the Force Silhouette pack is a pair of beam sabers.